At long last I made it to book 5 of the Parasol Protectorate series. We find Lady Alexia Maccon, formerly Tarabotti, ensconced in married life to Lord Maccon, alpha of the now London Pack. At the conclusion of book four, Heartless, the pack had been forced to move into town to accommodate swarming vampires and Timeless finds the pack and their alphas two years later dealing with their daughter Prudence and her adoptive father Lord Akeldama. All of it is very complicated and perhaps the reason why book four was my least favorite of the series. But Timeless does not serve its purpose as the final chapter in the Parasol Protectorate series. This go around Alexia receives a summons from Matakara, Queen of the Alexandria hive and the oldest living vampire. The Maccons, along with the Tunstells and their acting troupe, whom they take along as cover, set out for Egypt where, inevitably, they encounter adversity, mystery and adventure. The entire first part of this book is a retread and filler, with the author re-visiting some of the more memorable places and characters from the previous books – the hat shop now run by Biffy, the Woolsey Hive (with notable appearances from Countess Nadasdy and Mabel Dair), the fleeting return of Felicity Loontwill in a flurry of spite, the sudden reappearance of Lady Kingair and a single appearance of Guatve Trouve, in order to deliver a replacement parasol after the two intervening years to name just a few. After the lazy intro, the meat of the plot and the wrap up were rushed and left this reader feeling emotionally manipulated. But the most disappointing thing of all is that the main mysteries of the books – the Order of the Brass Octopus, the nature of the soulless/soulstealers – remain unanswered pretty much completely, unless you count the fact that Alexia’s abilities are discovered to be cancelled out when she is submerged in water. We also spend no time further investigating the BUR or the Shadow Council, or any other aspects of the supernatural world in Carriger’s universe. Noting all that, there is one storyline in the book that kept me from giving up on it entirely. The relationship between Biffy and Lyall. It was nice to have a homosexual relationship which was genuinely sweet and not reduced to stereotypes. I also appreciated the elegant solution introduced by Carriger to deal with Connall’s immortality and that our protagonist never voices any concern about becoming more aged than her love. But the thing I like most is Alexia’s personality remains very much her own, with her own separate interests, friends and responsibilities. I am however ready to be done with Alexia and her world. Can we talk about the cover of this one for a minute? Because surely I was misled. 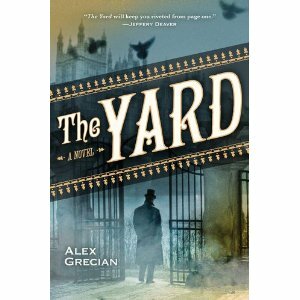 I enjoyed Alex Grecian’s The Yard and I picked it up by chance because my holds at the library weren’t in yet. I work at a Historic Site in New Jersey and we are hosting a Steampunk event again this year so I try to read some Steampunky literature to get into the mood. I saw that particular scrolling typeface on The Yard’s cover; read the dust jacket to make sure it sounded interesting. Via Goodreads: “Victorian London is a cesspool of crime, and Scotland Yard has only twelve detectives—known as “The Murder Squad”—to investigate countless murders every month. Created after the Metropolitan Police’s spectacular failure to capture Jack the Ripper, The Murder Squad suffers rampant public contempt. They have failed their citizens. But no one can anticipate the brutal murder of one of their own . . . one of the twelve . . .When Walter Day, the squad’s newest hire, is assigned the case of the murdered detective, he finds a strange ally in the Yard’s first forensic pathologist, Dr. Bernard Kingsley. Together they track the killer, who clearly is not finished with The Murder Squad . . . but why?” and decided that this one was for me. So about the cover – the scrolling, large, black capital letter only typeface has become short hand for novels in the Steampunk family. And I realized about 10 pages in, that this book is not steampunk at all, there is absolutely no anachronistic anything throughout. Now, it you want to talk about cutting edge technology for the time, the 1890s in this case, there is a great deal of time spent with the detectives and coroner talking about the new-fangled fingerprint technology and proper science of autopsy. While not the Steampunk novel I was looking for, this is instead a good old fashioned historical fiction mystery novel. While this book is a bit hefty (432 pages for the Hardcover version) it covers three days in the life of the Murder Squad, somewhere in the neighborhood of 7 dead, and at least three different criminals. While occasionally hard to follow, the chapters are broken up by time following the finding of the murdered detective. The narration also flows back and forth between third person narration from a few characters and then into italicized first person narration from one of the criminals. This is not a spoiler, since the character fesses up pretty quickly. Was it a perfect story? No. There were perhaps one to many plots, one too many characters and one too many locations to make this a smooth work of fiction. Was I entertained? Absolutely. This one was dense and intense and generally intriguing characters and a time period, the months immediately after the Ripper murders, which is perhaps underutilized in historical fiction. So if you’re looking for a Victorian murder mystery with no steampunk influences this is your book. I’m gullible when it comes to mysteries. Every red herring will throw me off the scent. 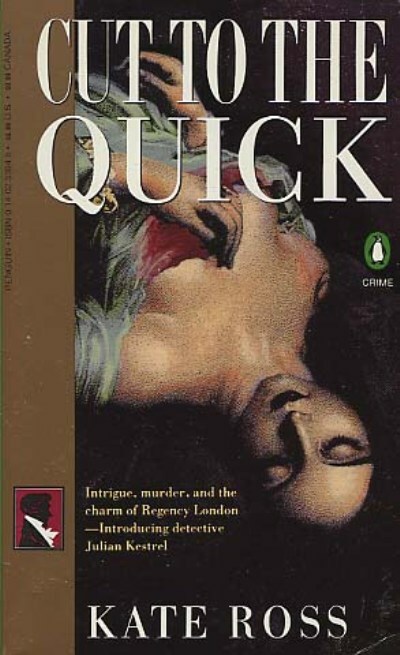 Cut to the Quick by Kate Ross brings a new set of mysteries and a new amateur sleuth from the Regency period into my life to continue confusing me for a few books. The sleuth in question is Julian Kestrel, the reigning dandy of London in the 1820s, famous for his elegant clothes and his imperturbable composure. Cut to the Quick was Ross’s first novel, but you’d be hard pressed to guess so. The only authorial problem I had with the novel was the very beginning. The book opens with a Mr. Craddock congratulating himself on tricking Mr. Hugh Fontclair into having to propose marriage to his daughter. The engagement happens and in the next chapter Hugh is sowing his wild oats at a gambling establishment and we are introduced to Julian Kestrel who rescues him from public embarrassment. In the third chapter we are with Julian as he receives a surprise invite some weeks later to be Hugh’s best man and house guest. It’s all very choppy and with so many of the characters introduced in quick succession it made it difficult to keep track of everyone. When Kestrel goes to stay with the Fontclairs at their country house, he is caught in the crossfire of the warring families, as the Craddocks are already arrived. Once settled into the dynamic and expecting Julian Kestrel to discover what blackmail is forcing the Fontclairs to agree to the wedding a dead body shows up. Kestrel sets out to solve the crime, since the body was found in his bed. The strength of this book is the twining of the two mysteries, which was compelling and well-plotted. As for Julian Kestrel, he’s fairly good company although I prefer his manservant and the local doctor. It should be said that all the supporting characters, more than ten, are well developed. Overall an enjoyable and quick read. I’ve already requested the next Julian Kestrel novel, A Broken Vessel, from my library system. In Unfamiliar Fishes Sarah Vowell brings to life the time in the history of the United States when it transforms into a world power for the first time and begins to most closely resemble the United States we have today.. Set with a Hawaiian backdrop Vowell explores the reality of missionaries and imperialistic conquests at the end of the Spanish-American War. Vowell accomplishes in her writing a goal I can only hope to dream of achieving. She makes history relatable and interesting while also doing the legwork and primary source research to substantiate the thesis. Vowell’s books are intended to entertain as well as educate so occasionally locating the thesis is not the easiest thing, but here’s the big ideas of this work: the United States as we know it, and particularly the 50th state, show the long-term effects of missionaries and trades people on indigenous populations. While this work focuses on the missionaries from the American Board of Commissioners for Foreign Missions and the sailors who arrived on Hawaii’s shores as part of the whaling and later sugar trades, it is the larger story of the transformation of the archipelago from the time of Kamehameha I to the dethroning of Queen Liliuokalani and the Americanization of those islands. It is not always an easy read, and it’s another example of a work without chapter breaks (and 235 pages), but it is a fascinating piece of our history which is often overlooked in a typical education. So pick it up and learn some things you didn’t know and have a laugh along the way.